"It's a monkey, not an appraiser." A few years before she became Jane, the sultry, sullen teen of American Beauty, Thora Birch starred in this formulaic but effective "kid and a monkey" family movie, here reissued by New Line. Birch plays Eva, a tom-boyish young girl struggling not only with schoolwork, but working to find her place with her mom (Mimi Rogers), new stepdad Tom (Christopher McDonald) and baby stepbrother Jack (Adrian and Julian Johnson). The trouble really starts when a Capuchin monkey with a bad case of kleptomania runs away from its abusive owner, and literally falls into the arms of Eva. Eva has to keep the monkey (whom she names Dodger) a secret, lugging it around in a backpack and hiding it in her bedroom, all under the clueless eyes of her parents. Harvey Keitel, complete with gold teeth, earring and bandana, and looking every inch like a modern day pirate, is Dodger's former owner, Azro. It seems that Azro has promised some gruff mobsters that the monkey would steal some jewels for them, so he spends the duration desperately tracking down his missing partner. Monkey Trouble is one of those nicely crafted family films that benefits from a believably strong performance from Birch, who has the unenviable task of competing with a monkey in just about all of her scenes. Even though the character of Eva is forced to wear those movie-clichéd "gosh, ain't she cute" overalls and sideways baseball cap, Birch has a breezy, natural screen presence, full of realistic exasperation and frustration, that she keeps from going too far into the realm of becoming overly sappy, or worse yet, avoids becoming the dreaded cocky sit-com kid. It wouldn't be fair to discuss the performances in Monkey Trouble without crediting the actual monkey. As a sometimes jaded film fan, I'm well aware that animal actors are trained to perform simple actions that look like natural responses to onscreen situations, and that the wonders of post-production editing can do wonders to make those actions seem more human-like. Dodger, the Capuchin star here, isn't relegated to simple cutaway reaction shots, and he interacts with Birch and Keitel with the ease of a seasoned performer, a fact that makes the monkey less of a unnatural distraction, even when he's doing such improbable (wait, I mean impossible) things as scribbling a good-bye note to Azro. I found the middle chunk of the film to be the most enjoyable, and that is where Eva and Dodger really cement their relationship together, amidst the expected hijinks and near misses. The final act revolves around the obligatory confrontation between Azro, Eva and Dodger, and it strangely borders on being alternatingly silly and genuinely menacing, no doubt a result of Keitel's threatening cinematic nature. If you're in the market to watch a family film (i.e. you have kids), then Monkey Trouble should do the trick. What kid doesn't like a cute monkey? Image Transfer Review: Kudos to New         Line for including both a 1.85:1 anamorphic widescreen and 1.33:1 full-frame transfer of Monkey Trouble on this release. With a number of studios opting to release only fullframe versions of kid-friendly films, it's always nice to have the anamorphic widescreen version available. The source print appears to have been a pretty clean one, as there aren't really any noticeable nick or scratches to be found, aside from a few specks. Colors are not overly vivid, but have a generally warm, well-saturated appearance. Edge enhancement and pixelation are minor annoyances, but don't distract too much from the presentation. Audio Transfer Review: Though New Line has issued Monkey Trouble with a 5.1 surround track, it really does not display much difference from the supplied 2.0 surround track; in fact, both tracks seem like slightly beefed up stereo mixes. Dialogue is clear, and the funky calypso music is equally clean, as well, but there isn't much in the way of distinct separation. Both tracks are more than adequate, but just don't offer any substantial fidelity, though neither detract from this cute, family film. Extras Review: Aside from a theatrical trailer for the feature, New Line has included a dull matching game called Pick the Flick! This game features stills from a number of "fun-filled New Line family films", and the object is to match the image with a choice of different titles. Are there people that actually like this stuff? The film is divided into 20 chapters, and includes optional English subtitles. When it comes to successful ingredients for a family film, you can't go wrong with a cute kid and a cute monkey. 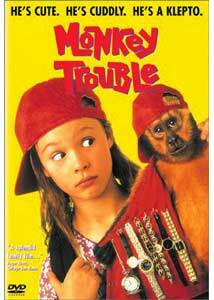 A young Thora Birch is pretty dang adorable, and she seems to work fairly effortlessly to avoid being upstaged by the equally charismatic monkey. Plus, you get Harvey Keitel as a cartoonish villain at no extra charge. This is a nice, family-friendly movie.